The Season in Chennai is not the real winter season. Neither the weather is very chill. In Chennai if one refers to a calendar month as ’season’ it is the December season of Music and Dance. Originally started as the ‘music season’ following an annual conference of the prestigious cultural organisation, The Music Academy in 1927, Bharatanatyam became a part of the annual festival after 5 years with E. Krishna Iyer, scholar, lawyer, writer and arts patron influencing the organisers to present dance shows. From then on, music and dance festival has become an annual affair in Chennai, with the already existing organisations like the Parthasarathy Swami Sabha and Rasika Ranjani Sabha hosting concerts for a week or more. 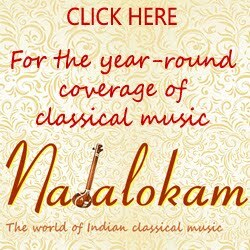 Technically, for the rasikas of classical music, the ’season’ begins with the Radio Sangeet Sammelan hosted by All India Radio through the broadcasts in November. The concerts in halls and auditoriums were hosted from mid December to end December. (The Music Academy still hosts their annual festival during this period). But the other organisations, who hold their events in other’s halls have to advance their schedule and so the ’season’ starts from late October/early November. With a few media and publication houses joining the band of organisers, different genres, academic and interactive sessions are now part of the season. 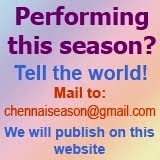 You can get to know all that you wish to know about Chennai and the most important season of arts on this website. The calendar of all events – classical and other genres of music and dance, harikathas, nama sankeerthanams, workshops, lec-dems and other academic and music appreciation sessions – will be available online for you to view all the time irrespective of your time zone. Reviews of music and dance concerts, the latest news from all the concert venues, bites from artistes, slideshows, podcasts, tidbits and a lot more can also be expected. Enjoy the season in Chennai – online and offline! Schedules will be updated as and when we get to know / receive them.